Nobody Wants Sore Gums or Missing Teeth! Gum disease is more significant than you might know. Gum disease is linked to serious health issues like heart attacks, Alzheimer’s disease and even pregnancy complications. Improper gum care can cause gingivitis, a mild form of gum disease (periodontal disease) causing swelling and bleeding of the gums. Without treatment gingivitis can progress into a more severe form of gum disease which may result in tooth loss. Nobody wants sore gums, nor missing teeth. Gum treatments are used to combat periodontal disease. There are different types of gum treatment methods. The type of gum disease and the severity of the gum disease determine which gum treatment is right for you. Gum treatments range from the least invasive scaling and root planning to bone graft surgery for the most severe gum disease cases. Our doctors assess the condition of your gums and prescribe the best treatment plan for you. As a patient, you play the greatest role in protecting your gums and keeping them healthy. Germs and food particles are the main culprits leading to gum decay and infections. Daily oral hygiene is key and provides the best proactive solution to fight both. Healthy oral hygiene is as simple as brushing and flossing daily. Check your mouth for the warning signs of gum decay. If you notice red or swollen gums, bleeding when flossing, or difficulty chewing call Masterpiece Smiles. Some patients in the early stages of gum disease do not exhibit any symptoms. Regular dental checkups and periodontal exams are the better choice in combination with great oral hygiene. 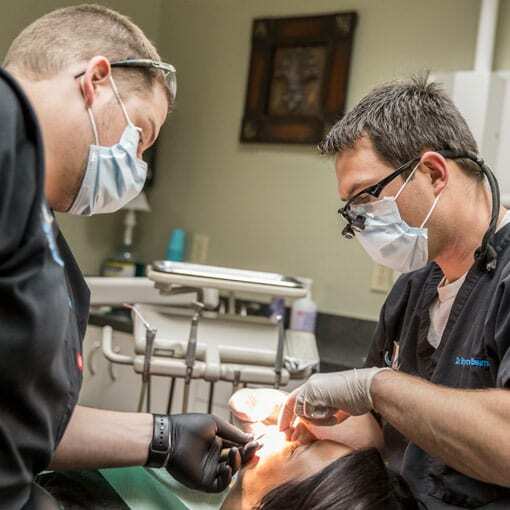 Our gum disease treatments are top-of-the-line. We incorporate the latest techniques and technology. Enjoy healthy pink gums, long-lasting fresh breath and strong beautiful teeth. Avoid gum disease or choose the correct treatment, schedule your checkup today!